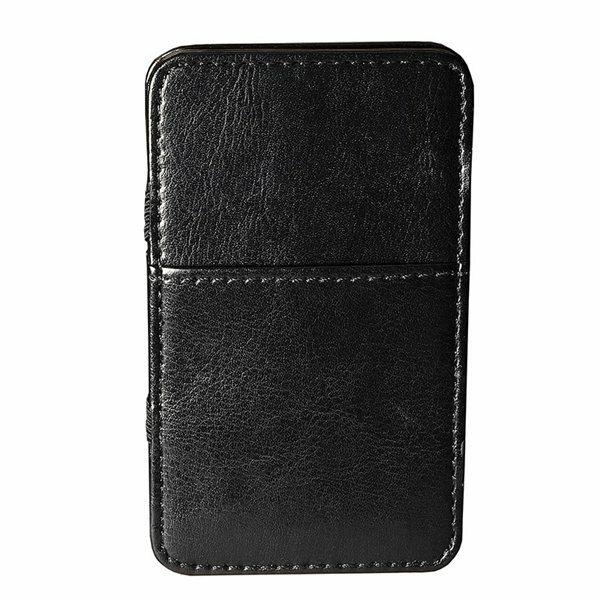 Easy to use soft PU leather magic wallet with open front pocket and real 3M™ removable adhesive panel to attach to smartphones. Front open pocket holds 1 to 2 cards (approx. 2.25"w x 2.5"h). Four interior elastic straps keep you money and cards secure. Avoid overfilling to maintain optimal stretch of elastics. Instructions included: open wallet, and place money or cards on either side and close. Flip over and open and you'll see your items filed neatly within the elastic bands. Note the double-sided 3M™ removable adhesive panel comes unattached inside wallet, therefore customer may opt whether or not to use as standalone wallet or with smartphone.